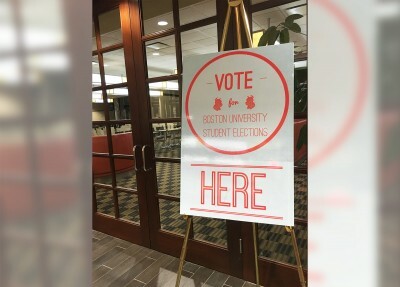 Members of the slates BU Recharged, Clean Slate and NewBU presented their campaign platforms Monday during a reception dinner hosted by the Student Election Commission to kick off the voting period of the Boston University Student Government Executive Board election. Approximately 15 students attended the gathering held in the Back Court of the George Sherman Union, where the slates were each given eight minutes to talk about their backgrounds and the policies they proposed. SEC Chair Grace Cusick said the reception gave slate members the chance to describe their platforms now that voting has officially begun. The SEC, which oversees the E-board election, encouraged BU students to vote for the slate candidates. Louis Vitti, who is running for president with the slate BU Recharged, reiterated the main points of their platform that includes initiatives for SG Senate to include more cultural groups and increase BU Shuttle hours on Sunday. Clean Slate spoke second during the reception, and its members reiterated the important parts of their platform while commenting on a number of issues they see in the other running slates. Clean Slate Presidential candidate Jake Brewer addressed his concerns over some members from the other slates and the work they have “failed” to do as previous members of SG. “My concerns, despite the qualities and experiences of the other slates, is that they are not committed to really bringing change to the university and taking on administration the way they need to be taken on,” said Brewer, a junior in CAS. After the gathering, Clean Slate’s candidate for Vice President of Internal Affairs, CAS sophomore Jane Dimnwaobi, said the slate will reach out to different student groups throughout the voting period as part of their grassroots campaigning. During NewBU’s allotted time, the slate members spoke about their personal backgrounds and how their prior experiences will help them if they are elected as E-board. Nadia Asif, who is running as the slate’s presidential candidate, told the audience about her life as a child of Indian immigrants who arrived in Canada with only $200. Several students who attended the reception said they hope the slates will avoid talking negatively of the other slates and expressed which slates they are interested in voting for. Yasmin Gentry, the current VP of Internal Affairs, said she doesn’t want the slates to become negative toward each other, because it would reflect on E-board. Joshua Mosby, a junior in CAS, said his experience being VP of SG two years ago makes him believe that Clean Slate is the only slate that can make a real difference. Akiko Endo, the current VP of Finance, said she hopes that the slates remain clean and positive in their campaigning. I hardly think pointing out information RE: some of the impacts of other slate members’ actions in student government is “negative”- if their experience is going to be brought up, we need to talk about all the things they did, not just the things they like. This event was great, it was nice meeting with everyone.